At work we develop an enterprise iOS application -- which is to say one that is listed on the Apple App Store. As such, we have a sales team which periodically has a need to demo the software. I used to go through quite the rigmarole to get the sales team set up for be able to demo the app remotely -- say via WebEx or GoToMeeting. With the release of Yosemite & iOS 8, Apple introduced a new way to do it. Start by connecting your iDevice to your Mac -- I haven't tried this in Windows, and I seriously doubt it works -- using a lightning cable. If iTunes starts automaticallty, then quit it (command Q, don't just close the window). Once that is out of the way, start QuickTime, which you should find in Finder -> Applications -> QuickTime Player.app. QuickTime will immediately ask you to open a file. Press "Done" since there is no need to open anything. Chose the option that would seen to indicate it is your iOS device. In the screenshot above, you can see mine is cleverly called "Kirk's iPad". Once you choose that option, your QuickTime window will get really small (probably) and then grow again. After it gets back up to size, it may be black (as seen in the video below). If that happens, then do some stuff on your iOS device -- change screens, or open and app or something. That's generally enough to get it going. 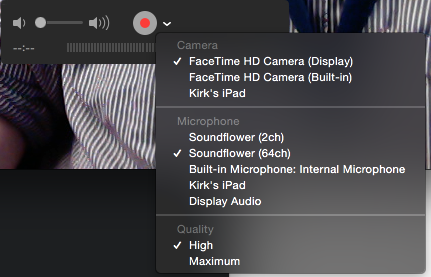 Lastly, and as an added bonus, if you hit the red dot, it will record everything you do, so you can rebroadcast it.